For most people released from prison in Illinois, incarceration doesn’t end when they exit the prison gate. There are currently nearly 3000 people on “mandatory supervised release” in the state who are shackled to an electronic monitor. These devices subject people to house arrest, creating enormous obstacles to finding a job, seeking medical care, responding to emergencies and trying to integrate into their communities. Rather than investing in resources that support individuals who are returning home after their incarceration, tech companies like the GEO Group and Securus are growing their electronic monitoring business and expanding the surveillance state. They only have one motive: making a profit off the most vulnerable, especially Black and brown folks living in poverty. 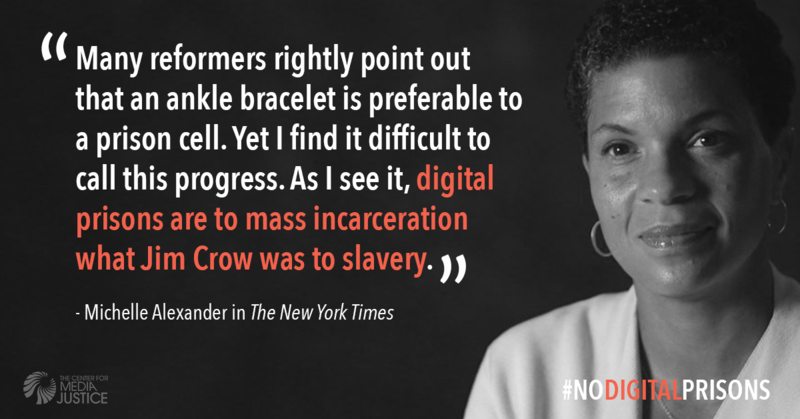 As Michelle Alexander recently wrote in the New York Times, “Digital prisons are to mass incarceration what Jim Crow was to slavery.” Which is why we’re demanding an end to the use of electronic monitoring for people released from prison in Illinois. Because when people have done their time, they should be cut loose, not made to jump through more hoops and shackled with even more barriers.